“A journey to a thousand miles begins with a single step,” so goes an old saying by Chinese philosopher Lao Tzu. In the case of the world’s richest tycoons, a single step led to multimillion dollars in net profit. Warren Buffet started out as newspaper delivery boy at a young age of 13. Jeff Bezos, CEO of Amazon, worked as a grill man at McDonald’s during his teenage years. Media mogul Oprah Winfrey was a grocery clerk while on full scholarship at Tennessee University. Michael Dell slaved some days at a Chinese restaurant washing dirty dishes. The Philippines’ wealthiest businessmen are no strangers to early struggles in life as well. 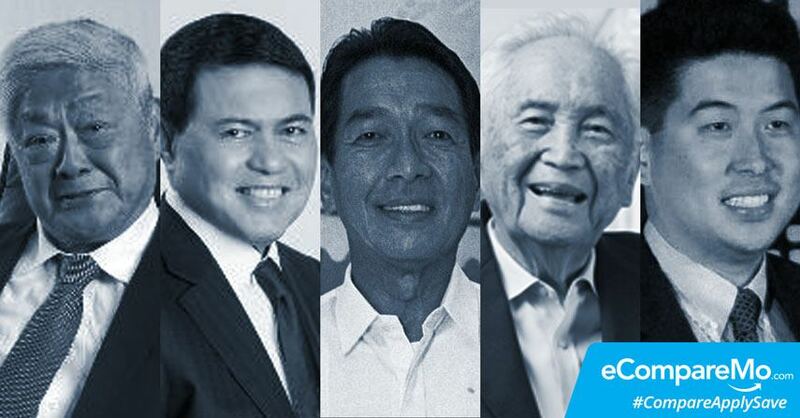 Know more about the first jobs of these Filipino billionaires and be inspired. His father’s untimely demise left the whole family in debt. To make ends meet, Little John sold soap, thread, candles, and other items that he could fit in his bicycle. Fate led him to explore Manila to sell items from Cebu and Lucena, and the rest is history for the JG Summit founder—currently the second richest man in the land. Once the poster boy for “sipag at tiyaga,” Villar was born in Tondo, Manila to a fishmonger and civil servant. After years of helping his mother sell shrimp and fish in Divisoria, he finished his studies and landed a job at accounting firm SGV & Co. Currently, Villar has major stakes in retail and real estate. His father’s early demise forced 12-year-old Yao to juggle odd jobs and aid his mother in raising his five siblings. Having borrowed capital from the banks, he built a printing company at 18 while attending college at the Mapua Institute of Technology. He stumbled into “doy packs” or “tetra packs,” then an unheard-of technology in packaging, during a trip to Europe in 1979 and used it to market his own juice brand. Thus marked the birth of his own Zesto Corp.
After completing his Civil Engineering degree in 1946 at the University of the Philippines, Consunji worked as a teacher in Bataan before becoming a concrete inspector for Kuenzle and Streiff Incorporated. He learned the ropes of construction over the years and founded DM Consunji in 1954. Tan did not have it easy either. From Fujian, China, his family moved to Naga, where he had to mop floors and do other menial jobs to send himself to school. He made it to college and studied Chemistry at the Far Eastern University. However, he quit before graduating and focused on making money from scraps. He started working at a tobacco factory where he was assigned to buy tobacco leaves in Ilocos. As a young man, Sia would man the counter of his family’s grocery store in Roxas City in Capiz. His life may not exactly be your typical rags-to-riches story, but it took foresight and persuasiveness for him to build a business of his own. In 2003, he borrowed P2.4 million from his father and opened Mang Inasal, the first barbeque restaurant of its kind in Iloilo City. It didn’t take long before he made his first billion in 2010, making him the youngest billionaire in the Philippines to this day.